The French Cafe is an institution in New Zealand. They have won countless awards ever since they opened their doors. This year, they won, yet again, the coveted title "Cuisine Restaurant of the Year". Hubby and I took a client to The French Cafe years ago but sadly, we didn't try their tasting menu. Since it was our 10th year wedding anniversary recently, I decided the momentous occasion required an unforgettable meal. Unfortunately, due to time constraint, we were only able to try the 6 course tasting menu (which was actually 7 as the first dish is complimentary). Luckily, it was only 6 courses because I was bursting at seams and could barely walk out the door. Conversely, hubby who has a bottomless pit stomach could easily inhale another 4 dishes. If given the choice, I'd always choose simple food served at little hole in the wall type restaurants. I've sat at tiny stools slurping down noodles by the roadside and shared simple peasant-type meals with Chinese officials. I rarely, if ever, frequent fine dining restaurants. Hubby has always prefers quantity over quality though, I think after 10 years of marriage and being dragged somewhat reluctantly to numerous food markets, trattorias, bistros and cafes, he's slowly coming around. 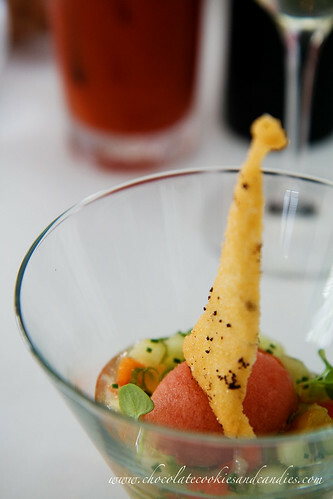 First one up is Amuse Bouchon, a complimentary dish which is a concoction of gazpacho jelly with tomato sorbet and an orange infused wafer. I never thought to marry the flavors together but somehow it worked beautifully. 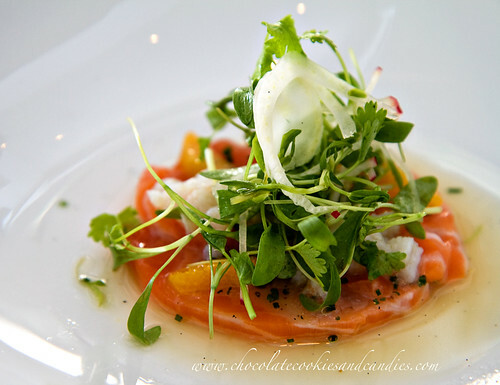 This was followed by sugar cured salmon with crab, avocado puree, shaved fennel, tiny but sweet orange slices and drizzled with vanilla dressing. I normally avoid raw food but this was delicious! Who would've thought vanilla dressing would go so well with raw salmon? Hubby's eyes lit up when he saw a dish with meat on it. 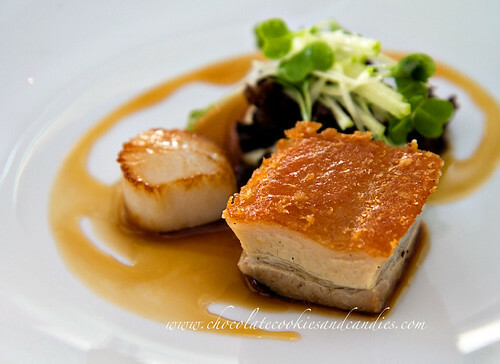 Caramelised pork belly with seared scallop, celeriac puree and black pudding. I can't fault this dish either. The next course was apparently the chef's signature dish. 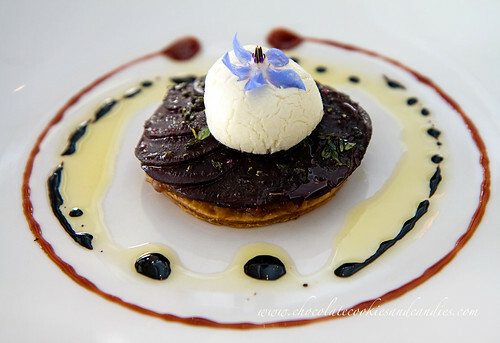 Roasted French goats cheese with caramelised onion and beetroot tart with red wine syrup. A beautiful edible Borage flower was placed on top of the cheese. I couldn't wait to dig into my pan-fried snapper with lobster, asparagus and pea risotto and lobster consomme and iberico ham. My only complaint was that it was slightly too salty. However, it could very well be me as ever since I cut down on the sodium intake, I've been finding food at restaurants too salty. The peas and asparagus were sweet and cooked just right. To cleanse the palate, green apple sorbet was served. 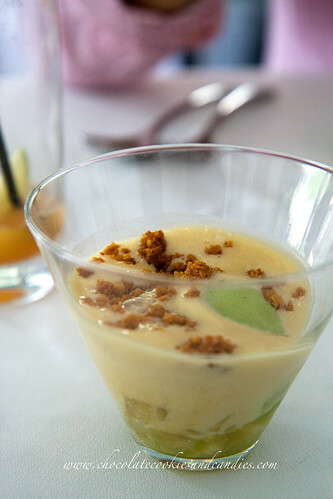 The sorbet was covered with butterscotch foam with apple compote as a base and a sprinkling of spiced bread. The chef and owner, Simon Wright is a master at experimenting and fusing flavors together. I could easily eat another glass of this. 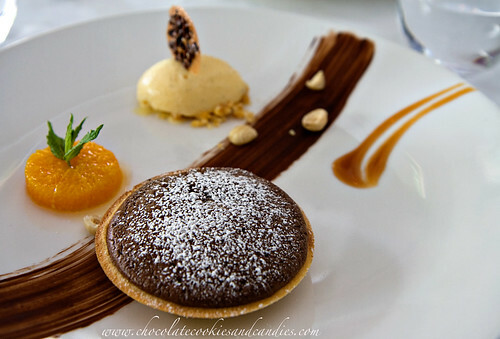 Our last course was chocolate souffle tart with caramel, orange, hazelnut double ice-cream. I'm still dreaming of this delectable dessert. I ordered a cup of flat white and I was surprised to find the coffee over-brewed and bitter. Our ever cheerful and attentive waiter offered to make another but we had to dash for hubby's meeting. All in all, it was an unforgettable culinary experience. Not to be missed!